John Melville (1902-1986) was an English surrealist artist, described by Michel Remy in his book Surrealism in Britain as one of the "harbingers of surrealism" in Great Britain. He was, along with his art critic brother Robert Melville and the artist Conroy Maddox, a key member of the Birmingham Surrealists from the 1930s to the 1950s. He was a Painter of figures, portraits, still-life and landscapes in oil and watercolor. Self-taught, he was attracted to Surrealism in 1930 and as a member of the Birmingham Group, joined the Surrealist Group in 1938. He was a contributor to the London Bulletin in 1939, and to Arson in 1942. 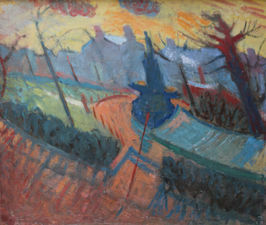 John exhibited his work first in London at the Wertheim Gallery in 1932, continued to exhibit in other 'places' in London and throughout the UK. His work is represented in a number of important private and public collections and his paintings often showed transformed figures and dream-like, unexpected conjunction of images. During the 1940s he painted portraits and still-life but returned to Surrealism in later works. Melville's relative isolation led to his work being neglected somewhat, but in recent years his reputation has grown and his singular style has led to his inclusion in a number of public exhibitions - notably "Surrealism: Two Private Eyes" at the Guggenheim, New York in 1999 and "Surrealism in Birmingham" in 2001. Jeff Jackson’s exhibition essay reprinted here (with his permission) expands on the development of Melville’s visual language. The Marvellous is always beautiful, any marvellous is beautiful, in fact only the marvellous is beautiful.' Andre Breton. In his authoritative book, Surrealism in Britain, Michel Remy has rightly pointed out that John Melville was, along with the likes of Paul Nash, John Banting, Edward Wadsworth, Tristram Hillier and John Selby Bigge, among the in Britain. Remy, who is Professor of English Literature and Art History at the University of Nice, and regarded as the leading authority on British Surrealism, goes on to argue that Melville's painting, The Museum of Natural History of the Child, is 'one of the key paintings of British Surrealism'. Remy explains that, along with the outstandingly talented Conroy Maddox, John Melville probably did most to develop the surrealist proposition in Britain by introducing visual distortion as a basic principle. But Melville's development as an artist is, in many ways like surrealism itself, not a straightforward journey from A to Z. If placing him at the core of British surrealism is essential to an understanding of his visual language, so then it is equally important to recognise Melville's journey to and beyond surrealism, to create a body of work over his lifetime that is, as the art critic Peter Davies has pointed out, 'vivid and at times visionary' and which never fails, 'to communicate an intense kind of poetry'. 'A beauty of strangeness born of unexpected meetings of word, sound, image, thing, person' Arthur Rimbaud. Melville's son Theo has pointed out that the path that led to his father's passion for painting remains obscure. However, as Theo notes, his father, along with his brother (the writer and critic Robert Melville), were frequent visitors to London in the 1920s. It was during this time that the works of Picasso, Matisse, Beckman, Ernst, Brancusi, and the writings of O'Casey, Cocteau, O'Neill, Brecht and importantly Breton were becoming available to the avant-garde in London. Melville was therefore witness to, and became part of, the most exciting and intense period of development within the arts in Britain since 1914. It is in this maelstrom, where enormous leaps were being taken to again confront modernity, that Melville's ideas and methods were tested and began to take shape. It was also, I would suggest, this grounding that imbues Melville's work with such power, and at times, immense pathos, that gave him such outstanding range and dexterity and crucially allowed him to flourish largely independently of the London art world. Three examples from the current exhibition serve to illustrate this point. The first, 'Three Women on the Beach' whilst containing the seeds of the surrealism that would follow, shows his complex understanding of Picasso - reminiscent of Picasso's Seated Bather (completed circa 1930) this work exemplifies Melville's skill, like Picasso's 'astounding ability', to be able to conflate several images into one. Three seemingly fearless nudes sit within the image before two boats, framed by shoreline and sky; it is almost a blueprint for a piece of sculpture. All three woman lack facial definition, and yet clearly their faces are present, dropped and re-formed by their shaped arms and breast. By the same token could not these arms and breast form a heraldic shield to cover themselves from the prying eye of the viewer? And then again could they not be representations of the African Tankagle or Dan mask? One can almost palpably feel in this work Melville's decision to confront Modernism directly in an effort to develop his distinct and powerful voice. The second work that illustrates his range and, importantly, his development into one of Britain's leading surrealists is 'The Artist's Model'. Melville here shows all the benefits of his early visits to London coupled with his integration within the surrealist movement (Melville along with his brother Robert and Conroy Maddox were pivotal to the establishment of the Birmingham based Surrealist Group, which was crucial to the subsequent development of surrealism in Britain). Completed in 1947 this is a marvellous example of Melville's technique of 'visual distortion'. The third example of Melville's ability as a painter of some importance are the self-portrait and the portrait of his wife. Both can be seen as 'classical' portraits and stand in almost contra-distinction to his surrealist portraiture. The portrait of his wife Betty, made in 1951, carries a feeling of great tenderness. A proud yet tired woman stares out with compassion at the viewer. Two round black pools form her eyes that have, like so many of her generation, seen the hope and despair of Europe in the first half of the 20th century. In front of a work of such tender pathos the viewer is almost compelled to offer a hand in aid. The self-portrait painted some thirteen years later, in 1964, is of equal strength. Melville portrays himself with some humility: a receding hairline, a furrowed brow with a somewhat troubled countenance looks back towards the viewer. But here we see no recluse beaten down by defeat and rejection. Two brushes are held forth in his left hand defiantly telling the viewer that we have not heard the last of this formidable man who sought to 'create reality rather than simply describe it'. Melville wrote in 1967 with almost telescopic (and somewhat skeptical) vision, '... there is no artistic opposition only an interminable mediocrity and what was understood as painting and drawing has vanished. The new mediocrity is as presumptuous in its claims as the old academics ... but I firmly believe that art has a future in another epoch and to that time I make my appeal.